At the top of Katoomba is a street whose name must puzzle many visitors. As people come out of the railway station they might see the sign proclaiming: GANG GANG ST. Of course, those of us who love birds know that it's named after a charismatic species of cockatoo, but I bet it's a long time since there were any Gang-gangs in Gang Gang Street. I can clearly remember seeing a small flock years ago eating the fruit of a cotoneaster in Kingsford Smith Park, right beside Gang Gang St. That would have been during the 1980s. Has anyone seen them there since? 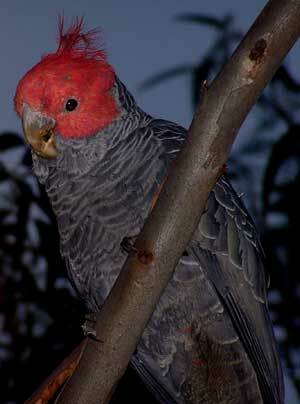 Gang-gang Cockatoos can still be found in many parts of the mountains - the male with his bright red head; the female all grey, each feather edged in red, pale grey or pale yellow with olive tinges, giving her an intricate beauty close-up. Both sexes have a wispy up-curled crest like a lacy frill atop their head. Often the first sign of their presence is a continuous cracking sound and a shower of gumnut pieces falling from the canopy of a eucalyptus. They growl softly as they feed on native seeds like eucalypts, wattles, geebungs, callitris as well as various exotic berries and nuts. 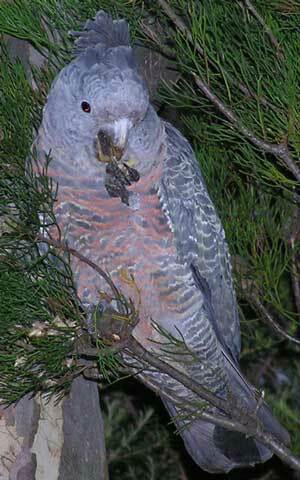 But like other cockatoos they are not strictly vegetarian and will tear open pupae and galls to eat the grubs inside. Surprisingly, they will also chow down on sawfly larvae, also known as spitfires because of the irritating liquid they disgorge when disturbed. The Gang-gang holds the spitfires in one foot while it eats the soft parts, discarding the skin and the head which is probably rather vile-tasting! In January 2012 I had the wonderful experience of seeing a flock of 50 Gang-gangs near Cabramurra in the Snowy Mountains. Here in the Blue Mountains the largest numbers tend to be seen at Mounts Wilson and Irvine, though I've never seen 50 there, and a few can usually be found around all the other upper mountains townships. They're altitudinal migrants, breeding in the wet forests of the mountains and moving into more open habitats and to lower altitudes in autumn-winter. They don't usually breed until 4 years of age. They're able to take advantage of some introduced plants, feeding on the fruit of certain weeds and garden trees. Despite this they are declining and listed as Vulnerable in NSW. The reasons for this decline are not well understood but loss of suitable nest hollows - whether due to general habitat loss, altered fire regimes or competition with more aggressive species - may be a major factor. 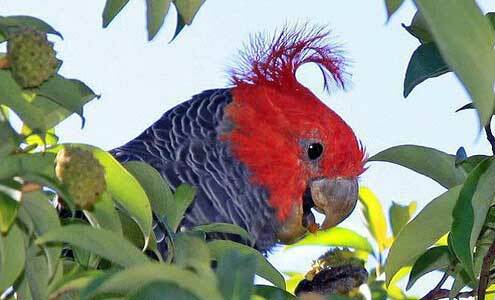 The spread of Psittacine Circovirus "beak and feather disease" has also been suggested as a threat. The name gang-gang comes from the Wiradjuri name and possibly other Aboriginal languages, and is thought to be onomatopoeic, describing the call. Their call is unforgettable! It sounds like a rusty, creaky hinge with a rising inflection. Or like a cork being pulled from a bottle - a sound which is becoming quite rare these days, a bit like the bird. The article above first appeared in the June, 2014 edition of Hut News.